Place and Displacement is an inaugural competition hosted by Ideation Worldwide (IDeA) which aims to create a discourse on refugee livelihoods. The competition embodies the dignity and resilience of refugees working to protect their autonomy, creativity and capability in difficult conditions. Place and Displacement challenges young minds around the world to formulate an interdisciplinary proposal for driving innovation in marketplaces in refugee settlements. Our team, together with our jury through remote judging, went through all the submissions meticulously for weeks and weeks. We were overwhelmed with the amazing selections of work from our young participants, observing a level of creativity that we have never seen before. The depth of research, level of technical knowledge and understanding of complex cultural and anthropological issues put into the proposals were worthy of the highest adulation, showing applicants’ passion for humanitarian causes. The applicants were eventually narrowed down to 26 finalists, who have submitted proposals which we believe not only capture the spirit of our competition, but can really help refugees to overcome the challenges they currently face. On February 27th and 28th, our jury team came together once more at Yale University and UN Habitat office New York, thanks to our partner and our collaborator Yale MacMillan Center and UN Habitat, for an all-day discussion to decide on the winning team. The meeting of experts in their fields from around the world, , presented with 25 of the best ideas from the younger generation, constituted a nucleus for ideas that can challenge the fundamental principles of traditional architecture and humanitarianism. The synergy between architecture and humanitarianism raises many important questions, including the overall goals and definitions of architecture and humanitarian action themselves. Considering metrics including creativity, feasibility, depth of research, and scalability, four teams were selected as Honorable mentions, who will receive $1000 each. Three teams were chosen through unanimous decision as the overall winners, and will be awarded $7000 and invited to the summit to present their ideas to a live audience. 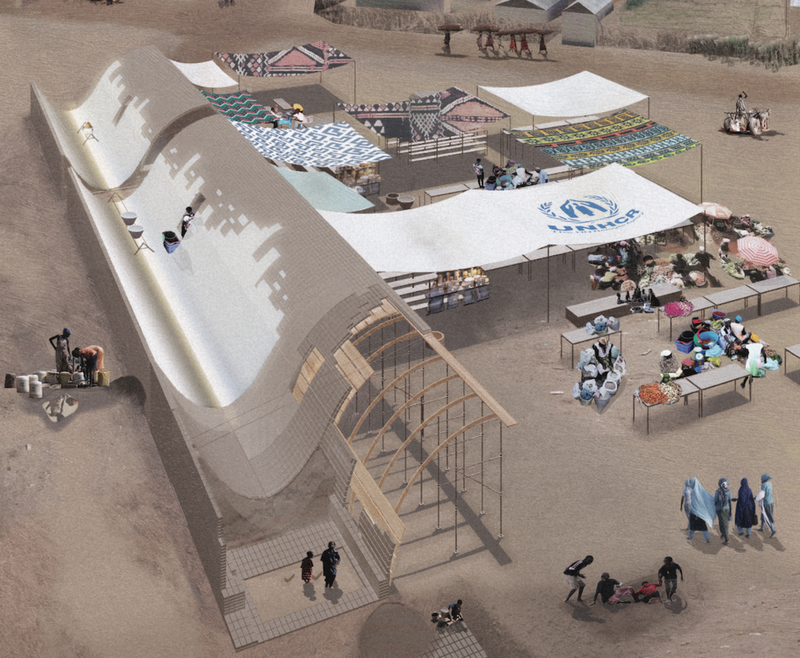 Ideation are therefore proud to announce the winners of IDeA/Ideation Worldwide “Place and Displacement” Refugee Architecture Competition 2017. These three teams will be joining us and our speakers in New York on 22nd April for our Ideation Worldwide Summit. After each of the team’s presentations, one team will be announced the grand winner, and receive an additional $3000. 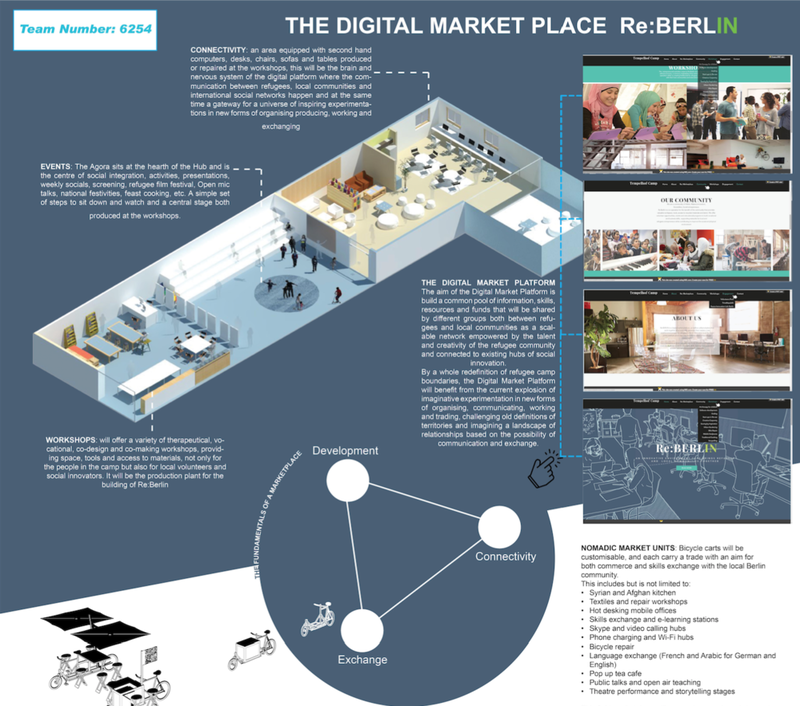 A Digital Marketplace and Skills Exchange Hub to assist the integration of Refugees in Berlin. Moving beyond provisional accommodation and basic protection, the Platform seeks to build on refugees talent and capacity to create livelihood opportunities and self-sufficiency, while offering protection to the most vulnerable. Combining digital means and physical infrastructure, it endeavours to overcome the barriers faced when trying to integrate local economies and communities, re-positioning the idea of refugees as an agent of positive change both in new societies and back their communities. In harsh conditions such as Kakuma camp, markets play a critical role in providing the refugees necessities not covered by the humanitarian agencies. “Water Wall” is a proposal for a structure that uses the technique of evaporative cooling for storing and cooling fresh food, critical to ensure good nutrition and health of the inhabitants. In this new zero energy market the refugees, by processing and selling the goods, will have the possibility to improve their entrepreneurial skills, and the new food-based economy will be a solid base for the birth of new jobs and services inside the camp. A protected market place connected to the UN Women compound, consisting of workshops, child care, social areas, and retail spaces. The female population is under-represented on the Za’atari job market, so the Women's Bazaar will be a safe space for working and social activities. The architecture and spatial organization of the retail area function both as a protective barrier and link with the public market street. Architectural elements reflect the origins of most of the Za’atari population. The construction system is scaleable, assembling into different spatial configurations.